Gumdrop has done it again, earlier it released cases even before iphone 5 was released giving us some idea of its shape and size. Now Gumdrop has released cases for iPad 5 even before one week of its release! 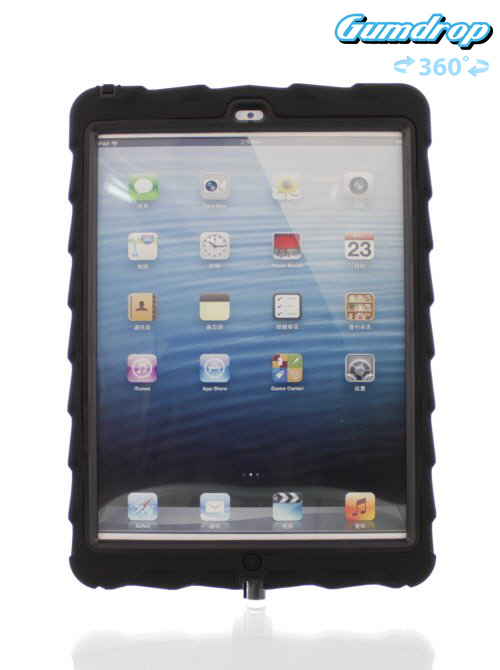 The new case gives us some clues about the design of the new iPad. The new iPad will be thinner and narrower. MacRumors says that the new iPad will be 15 percent thinner and upto 33 percent lighter than the current iPad. Gumdrop has posted a 360-degree comparison of the new and old iPads inside its cases, which also shows the new iPad to be narrower. The ports for buttons and cameras all appear to be in the same places as current models. Gumdrop knows so much about the new iPad because it produces all its goods in China where manufacturers swap information so that a specific region gets a lot of employment jobs. Gumdrop is offering three case designs for the iPad 5: the Drop Tech series, the Drop Tech Designer series, and the Bounce cover. They range in price from $35 to $60. Previous Apple Introduces MacBook Air with 12 Hours Battery Life! Next Google Removes Chrome Extensions!